Today’s concealed carriers are, at least by my observations, an increasingly sophisticated lot, expanding their skills repertoire beyond shooting to include disciplines like facility security, team tactics, and emergency medical intervention. Pursuant to that, many who carry guns, including myself, now carry tourniquets (TQs) too. With proper training on the tourniquet of your choice, your life-saving capacities double when equipped with the power to stop rapid blood loss. But, as with holster selection, the next question becomes, where do I carry this darned thing? Just changing from regular jeans to carpenter’s or cargo pants/shorts gives you room to carry a small tourniquet. I often carry the stretch, wrap, and tuck tourniquet (SWAT-T) this way. It can function as both a compression bandage and as a tourniquet, fits easily into a cargo pocket with room to spare, and is within fingertip reach. This is the fastest, yet most minimalist, method of TQ carry I’ve found. The Flatpack is an ingenious little flexible plastic device that can mount on a belt or on the MOLLE of your favorite pack or range bag. I’ve carried a Combat Application Tourniquet (CAT) and Special Operations Forces Tourniquet (SOF-T) in this device. 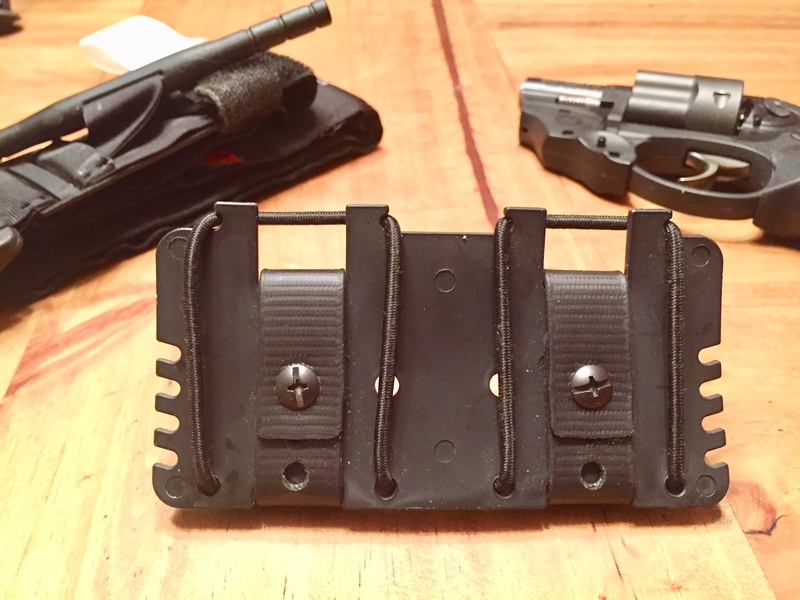 Using it is simple—just lay the TQ on the Flatpack, and pull the two attached loops of shock cord over it, securing them in the teeth on the plastic board. I like to face the unfixed attachment points upward as I wear it, which I feel makes accessing the TQ easier when it’s on the small of my back. The Flatpack’s biothane-like straps can be unscrewed to hold the TQ on the outside of your pack where it’s handy but not on your person. Mounting it that way does take some time, but carry is then as easy as picking up your pack. I like to thread my belt through the loops instead. $24.99 is steep for this brilliant, but feather-weight accessory. I think it’s a great concept that would be seen a lot more if the price were significantly lower. At last, this underdog of an accessory is gaining some traction in the market. 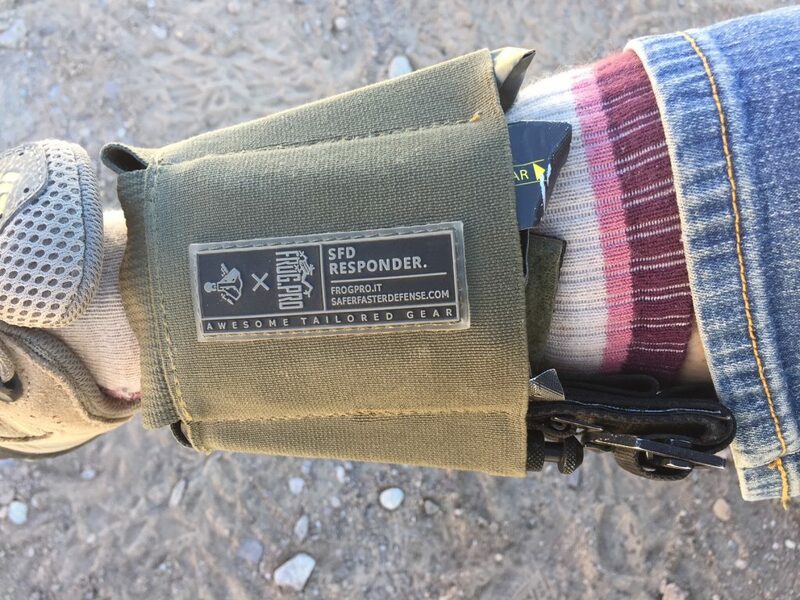 My personal choice of an ankle individual first aid kit (IFAK) is the SFD Responder 2.0, sold in the US by SaferFasterDefense. A great advantage of this device is the ability to carry a true “blowout kit” almost effortlessly. It may not look like it, but it’s so comfortable I often forget it’s there. In another article on this product, a reader asked how I carry a chest seal in this kit without folding it. The answer: improvisation. A few rolled bumper stickers can make do. Better yet, a length of duct tape wrapped around a Sharpie make a dual-purpose tool. The SFD Responder is really comfortable. This particular brand sells for $68.95 and has a painfully slow six-week delivery. SFD makes a great product, but they need to improve their production and shipping processes to compete with other companies making similar IFAKs. This is a less accessible method, but nevertheless a useful one that I not only employ, but have used. Inside a roomy fanny pack, which hangs on the back of the driver’s side headrest of my vehicle, is a complete blowout and first aid kit. The TQ is front and center; easiest to reach. On two occasions, my business partner and I have encountered highway accidents where EMS had not yet arrived. Grabbing this kit off the headrest was easy thanks to the squeeze-buckle on the fanny pack—or just keep the strap long enough to swing it over and off the headrest. 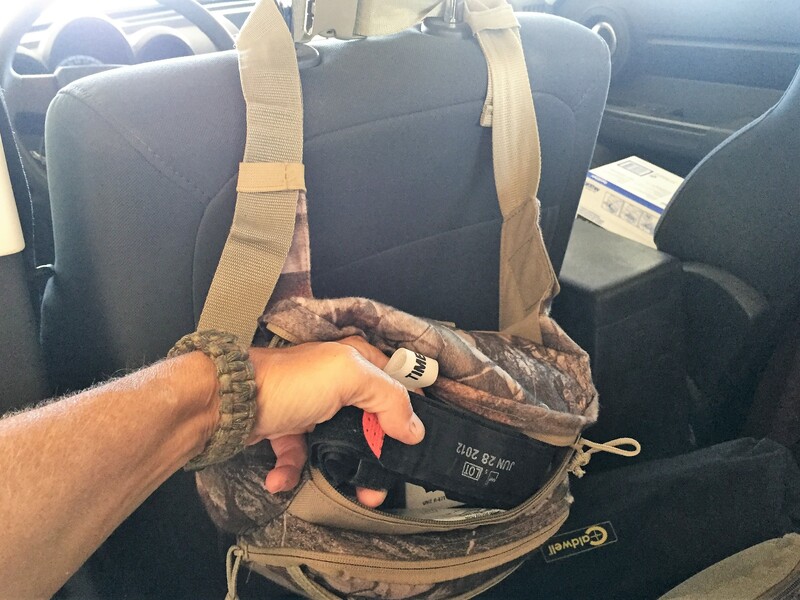 If you need to go hands-free during a rescue, the pack can buckle around the waist so it doesn’t get lost. On another ultimately fortunate afternoon, I fell doing a household repair and caused a severe arm laceration that proved not to be arterial, but with severe and rapid blood loss. Since I wasn’t doing range stuff, the TQ wasn’t on my person as is my MO at the range. I managed to run to the car and self-apply a CAT. Since then I’ve had even more peace of mind that training works, so long as you’re equipped to use it. The vehicle headrest is a good alternative to off-body TQ carry. The cost is whatever you want to spend on a fanny pack! 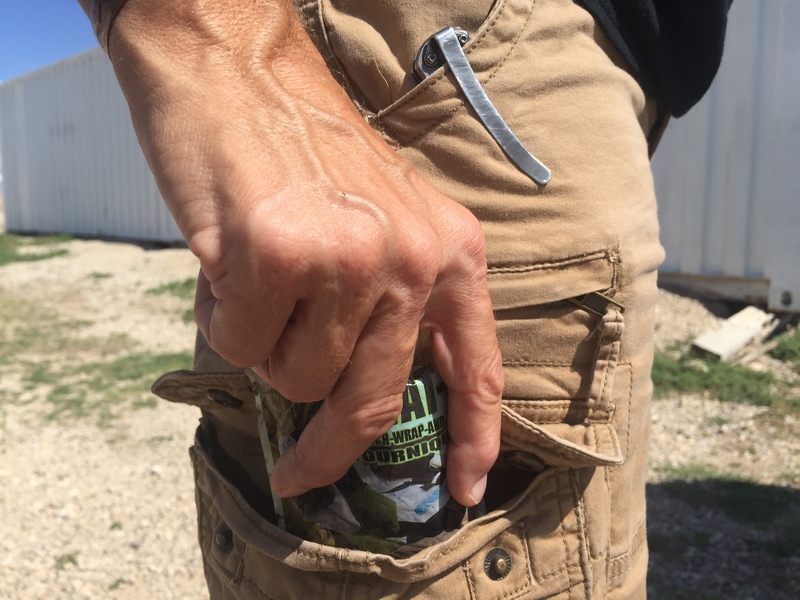 If you’ve moved sufficiently forward in your concealed carry training, you’ve probably encountered lessons or perhaps took your own initiative to figure out how to unholster and handle your firearm with the non-dominant hand. This skill also applies to TQ carry. Ideally, you’ll figure out a way to access your on-body TQ with either hand, in the event one should be unusable. Stopping rapid blood loss is a skill everyone who’s serious about protecting themselves and their family can and should learn, whether or not they carry a gun. It’s more likely to be needed than CPR, simple to learn, and inexpensive to equip oneself. If you’re not trained yet, I encourage you to change that, and to practice with your chosen equipment. – slide into the horizontal pocket that runs the width of the rig. A Mini Compression Bandage (H&H) with a set of gloves in a second large pouch. All secured by hook and loop straps. Highly recommended, I bought 2 more for back up but am still using my 1st and it is holding up beautifully ! TCE-MI, thanks for the recommendation. Glad to hear you’re walking around ready!